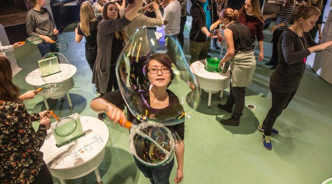 Making soap bubbles has always been one of the most engaging activities at Experimentarium. 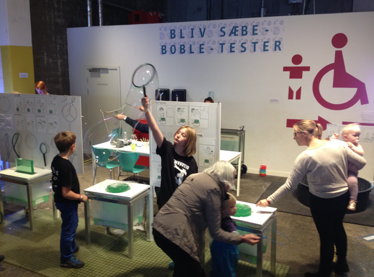 Our visitors intuitively love the beautiful, volatile bubbles and they experiment for hours. 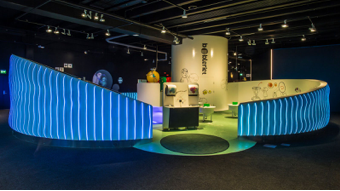 Consequently, we had to make a spectacular Bubblearium for the new Experimentarium we were opening in 2017. In this article, I will describe the iterative, user driven development process used to create a beautiful and functional exhibition. Soap bubbles are amazingly engaging and can help explain phenomena such as refraction of light, minimal shapes and fluid streamlines. However, they also consist of soap and water, which can be a time-consuming challenge for science center staff, who have to keep the place clean and non-slippery. Consequently, it needs to be designed to support both staff and visitor activities. As the process-diagram shows we explored three tentative designs through three iterations that ended up in a fourth and final design. The ideas of each tentative design should help highlight the practice and motivation of visitors and staff when they were engaging with the exhibition. 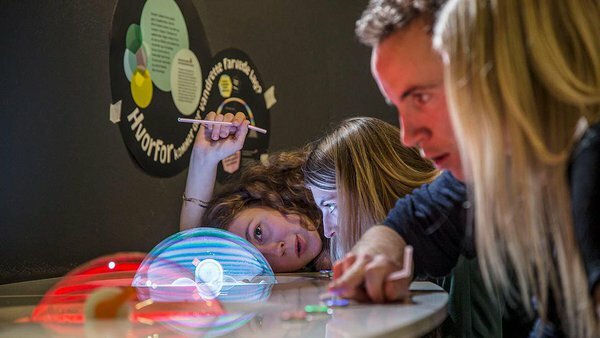 First step was to explore our old soap bubble exhibition – Design 1- and learn from it. Design 1 consisted largely of old kitchen sinks and plastic tubs. This meant that they only allowed a few visitors at a time to engage and that they were difficult for staff to clean properly. Consequently, we started observing our visitors’ behavior and asked staff to document the procedures of cleaning and handling the exhibition. These experiences were to be incorporated in Design 2. 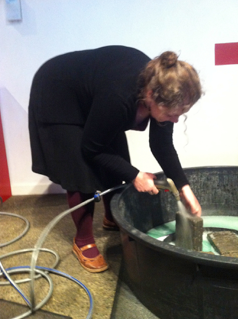 Figur 1: A staff member demonstrates how to clean a plastic basin in Design 1. In Design 2 we created a conceptual model of a new soap bubble exhibition, that would consider our experiences from Design 1. Design 2 also incorporated new ideas, such as integrating the colours and shapes of soap bubbles in the design and making the exhibition accessible and more social. Figur 2: A conceptual model of Design 2 in scale 1:50.000 with small dolls to play out new practices of visitors and staff. The idea of using a model as Design 2 is based on design-game theory where physical objects are representations for pre-existing worlds. Users and designers play out future scenarios to think, create, communicate and collaborate in a different way than when relying only on discursive practices. By letting staff members and users play with small dolls and describe their activities in the model, we could foresee some of the benefits and obstacles of the design which helped mediate between designers and users. Again, our experiences were incorporated in Design 3, which consisted of mockups of selected activities. We made for example mockups of round overflow basins that should prevent foam (foam is the worst enemy of a soap bubble, as it will make the bubble pop) and support social interaction. 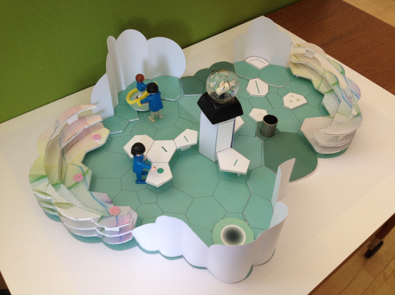 Design 3 was tested in our main exhibitions by visitors and staff at a weekend activity. Observations and interviews helped identify in detail where to improve our designs. Figur 3: A mock-up of Design 3, where staff and visitors can experience the preliminary design and give feedback on the functionality of the activities. Finally, when we build the full exhibition – Design 4 – we could feel assured that both staff and visitors would be satisfied with the concept, the design, and the activities. 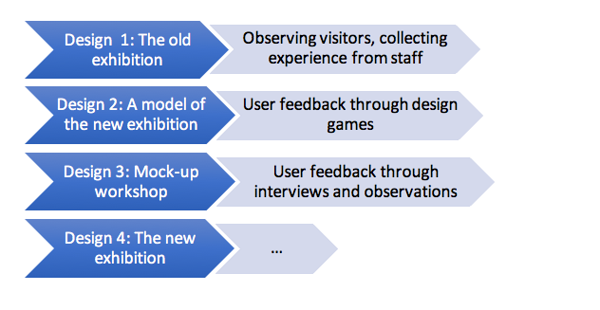 Creating good processes for development has a major influence on how we reflect on our exhibition design. At Experimentarium we are eager to learn more and to share knowledge and practical experience about development processes. Please send us an email if you would like to hear more or share your stories!